Harry Tanner is back on the scene. And my God does he look very-very mean! Martian Manhunter agrees. Jenny Quantum eats cheese. Plus Apollo and Midnighter both listen to the Queen. Just like Writer: Peter Milligan; Artists: Ignacio Calero; with Publisher: DC Comics in May 2012. Let's dance people. Now I do find that this issue of Stormwatch, called 'Digging Up The Past', is a tale that is exactly like what it says in the title. Can you dig it? Yes you can. You see, whilst our stormy crew of watchers prowls the globe for the reason why so many super-humans are popping up all over the place, suddenly, out of the blue, they get a strange sighting in France. No. Don't fret. It has does not have anything to do with the French. Instead, they discover that a professor named Finley, has dug up an old Stormwatch relic, which has strangely turned him into a rampaging monster of no fixed ability. Therefore, in retaliation of his occurrence, Stormwatch do what they do best to resolve this matter - bang, biff, bam. Meanwhile, in Antartica, Harry Tanner and his hostage, the Projectionist, begin to recruit a new team of their own. OK, I have to confess, I am a right sucker for colloquialisms whenever one crosses my path. In this story it was when Professor Finley declared 'Oh my sweet giddy aunt' when he started tinkering about with the Stormwatch artefact. Please note, this is an old English expression which signifies shock and surprise, like 'Oh my God'. I really did like reading the reason as to why Stormwatch wasn't allowed to go public anymore, because this justification reminded me of the Alan Moore series, 'League of Extraordinary Gentlemen'. And lets face it - anything that is remotely related to Alan Moore is great, huh? I have never been a big fan of mumbo-jumbo talk myself, especially when it is made up for the sake of exposition. Listen, I am not trying to imply that the 'technical exposition' in this tale isn't relevant at all. Oh no! Just that it was not very clear. STORY: Apollo's 'gay dilemma' was the stand-out scene for me within this tale. In many ways I feel that 'Andrew' airing this concerns to Midnighter in the manner that he has, almost acts as a pariah for things to come. ART: By in larger I did like Ignacio Calero art within this story, particularly in the way that his panels were packed to the brim with emotion and dynamism. However, too many inkers have made this tale visually inconsistent in places; and slightly jarring by default too. PROFESSOR FINLEY: He has the size. He has the statue. And he can even grow a beard if needed. So come on, don't you think that John Goodman would be a good match for this monstrous cleaver clogs? CANDCIE: Wouldn't it be a blast if John Goodman's one time television daughter, Sara Gilbert, could play Professor Finley assistant? OK, I know that Sara's a bit older now. But so what! Huh? She makes the grade. 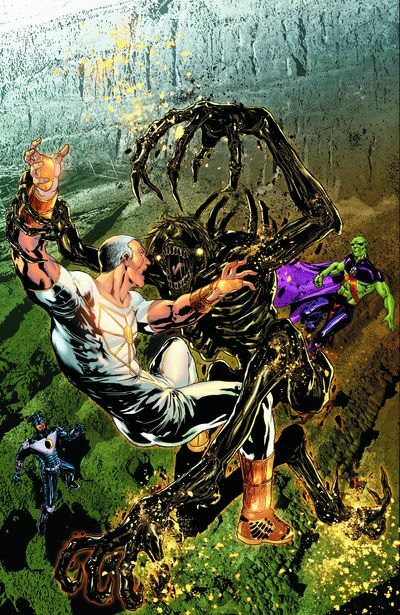 Don't Dig Into The Past Of Stormwatch Or Else It Could Make You Into A Monster. Literally. Conceptually this story was rather rhythmical in places, and had an almost old-school flavor in telling its tale. Just like theme tune for the movie 'Holes ' in fact. Compared to some of the previous instalments of this series, I found that this one dipped a little bit in comparison. Not a big dip mind you. A small dip. Like a crevice upon a teenagers face. Though, on the reverse side of this argument, I am looking forward to what Harry Tanner has up his sleeve for the future, as well as how the other heroes will react to this team when it is eventually revealed.